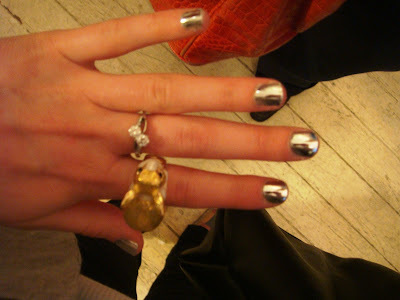 Let me introduce you to my latest obsession, MINX nails. Minx is essentially a very thin sticker that adeheres to your nails perfectly and the patterns are AH - Maz- INg from plaids to leopard (which I am rocking) to darling little anchors you have to get it done! I got mine done at a darling spa called Extremedies in Los Angeles. If Gaga and Beyonce are on board...so am I.
did you love em? i had them done a few weeks ago in the solid silver. they last about a week and a half with compliments for days!